Need to be picked up late at the airport after a two-week trip? Not only would Jonathan Donehoo do that, but he’d have purchased breakfast food for you so you wouldn’t have to go to the store that night. You’re a current or former student in a time of trouble and confusion? Call Jonathan — in the middle of the night if you just have to — and ask for advice. Everybody else has. At a reception honoring his career upon his retirement in 2014, Jonathan Donehoo holds his framed document signifying his recognition as Professor and Director Emeritus of the School of Design. 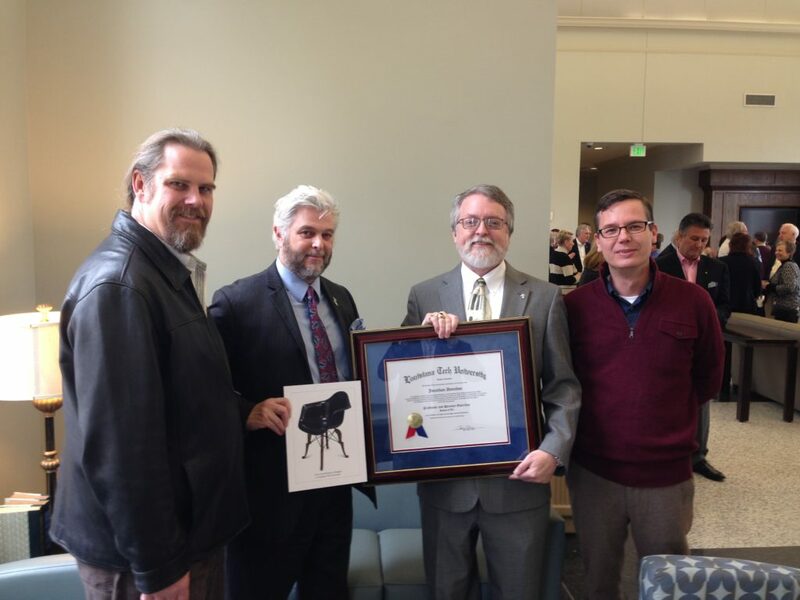 Pictured (from left) are his former student and colleague Patrick Miller, Dean of the College of Liberal Arts Dr. Don Kaczvinsky, Donehoo, and Director of the School of Design Karl Puljak. Need some coffee? He does too. How quickly can you get to the Nespresso in his office in the F. Jay Taylor Visual Arts Center? The former director of what is now called Louisiana Tech’s School of Design, Donehoo made cultivating friendships an art. Associated with Tech for more than 30 years — and from 2006 until his retirement in 2013 the Director of Tech’s School of Art — Donehoo was appointed co-director of Tech Rome early in his career, served more than 25 years in that capacity, and radiated a deep love for both his students and travel. “What set Jonathan apart as a traveler was his absolute passion for taking people with him on his journeys, profoundly connecting his travel companions to places around Europe,” said Karl Puljak, Tech’s current Director of the School of Design and a friend who “drank many coffees — hundreds,” Puljak said, in Donehoo’s office. Donehoo loved breaking the “do not photograph” rules at museums and had in his Ruston home a “uniquely Jonathan collection,” Puljak said, of cobblestones he’d swiped on each of his trips to Europe. “Jonathan did his research as the resident tour director of Tech Rome,” said Dablow, like Donehoo a former director of the art program and professor emeritus; the two longtime colleagues began their friendship in University Hall roughly 35 years ago when Dablow was the head of the Photography program and Donehoo was the head of the Graphic Design program. In another year, Donehoo used this contact to gain entry in to the Vatican archives: one year he was given permission to hold a Leonardo da Vinci manuscript, and on another he saw the actual divorce documents of Henry the Eighth. He didn’t stop traveling after retirement. He took friends with him to places he knew they’d enjoy — Paris, London, Rome — and “he gave them an experience they would always remember,” Dablow said. He visited students who became grownup friends in New Orleans, Vancouver, Virginia, and on Lake Ouachita in Mount Ida, Arkansas, where he was planning to move. “He was truly an umcommon man,” Dablow said. “He always reminded me that the things that you ultimately regret in life are not the things you choose to do, but the things you choose not to do,” Puljak said. “Ultimately, I think he chose very well and am so very happy to have known him in this life. A service was held to honor and celebrate his life on March 15 at the Episcopal Church of the Redeemer, in Ruston. The family requests that friends consider a gift to the Jonathan Donehoo Memorial Fund at the Louisiana Tech University Foundation. This fund will help to support students of the School of Design participate in the study abroad program that was so dear to Donehoo. I met Jonathan Donehoo in the Spring of 1997. I was in undergraduate school at The University of South Alabama looking at Graduate Programs. One of my undergrad professors, Clint Orr (a Louisiana Tech BFA/MFA graduate), recommended I go visit Jonathan in Ruston and get a sense for the MFA program. The School of Art had recently moved from what was known as the VAB, now University Hall, into the newly refurbished Wilson Cafeteria to become the Visual Arts Center (VAC). At that time, Jonathan’s office was downstairs. Upon entering his office, Jonathan offered me a cup of the world’s finest coffee all while being surrounded by the glorious sounds of Bach’s Prelude No. 1 in C Major. After walking him through my portfolio, we commiserated about being oldest children, ruling pens, the importance of travel, and what life is like as a teacher. We struck up an instant friendship and I made the decision in the first 30 minutes of our meeting that I needed to be in this program and learn from this incredible person. While in the MFA Program at Louisiana Tech, Jonathan taught me how to navigate the University System, write grant proposals, develop course curricula, how to be somewhat defiant in a sea of requisite blue ink signatures by using a fountain pen with brown ink, and most importantly, how to positively connect with young people in the classroom. He taught me that it was OK to be tough, because in the end, it yielded strong students who were ready for the rigors of the workplace. He also brought out my love of teaching. And not to miss out on a travel opportunity, Jonathan encouraged me to join him and 100 other students and faculty on the Louisiana Tech Rome Program in 1998. Jonathan lead our group to view and experience some of the finest art and architecture Europe has to offer. He also arranged for a number of unique experiences for a very select few, that included strolling on the roof of the Duomo in Milan, climbing up to and walking around the cupola atop St. Peter’s Basilica, ascending to the top of the Victor Emanuel Monument, along with many other amazing side trips. While experiencing these amazing sights and sounds, I also met who would become my future wife, Rachel Longfellow. In 1999, I graduated with my MFA to embark on a career in academia, I interviewed and accepted my first teaching position, and Rachel and I got married. Jonathan served as one of the ushers in our wedding and walked my mom down the aisle. Ruston became a touch point for Rachel and me. In our travels to her home in Minden, we always made a point to visit with Jonathan. We spoke regularly via phone, email, iChat, and Facetime. In 2009, Rachel and I made a decision to depart Starkville, Mississippi, where I was teaching, and return to her hometown of Minden. Within a week of our arrival, Jonathan, now Director of the School of Art, called and offered me a position on the design faculty. I am a better person having known Jonathan Donehoo. He served as my academic mentor, my leader, my colleague, my boss, my life coach, and most importantly, my dear friend. In 2014, Jonathan retired from his life in Academia. I had the honor of preparing documentation and navigating the University System enabling him to retire with the title of Professor AND Director Emeritus. I made sure to get some of the required signatures along the way in brown ink.